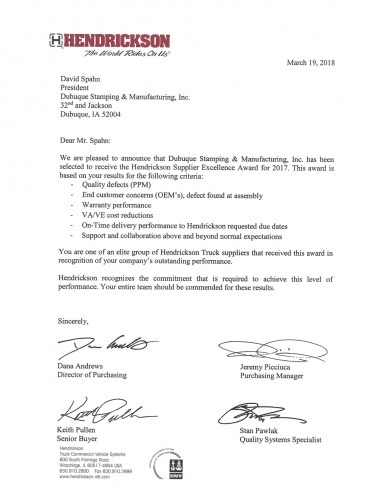 Hendrickson Supplier Excellence Award - Dubuque Stamping & Manufacturing, Inc.
Dubuque Stamping and Manufacturing, Inc. has been awarded with the Hendrickson Supplier Award of Excellence for 2017. This is a great honor and emphasizes the kind of service that we offer our customers. We are always striving towards excellence in the Steel and Stamping industry.